"it's hard with a telephoto lens to tell exactly where the riots took place." so what can matt and i glean from our respective subconscious experiences? matt wishes he were russell crowe and i should have never let that xanax prescription expire. new story: we don't have a washer or dryer here, so usually our mexican housekeeper washes the laundry by hand, except when she gets the stomach flu and disappears for days on end, which, oddly, has been happening on a regular basis... (?). i digress. 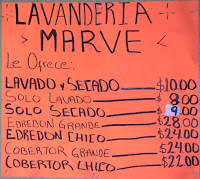 so when our pile of laundry started taking on the girth of pluto, i chucked our dirty clothes in a sack and headed to the neighborhood lavanderia. i plopped my bag of belongings onto the counter, just as some hurried-business-type walks in and stands right next to me at the counter and starts to "hover." hoverers make me nervous anyway, but i was especially uneasy about his over-bearing presence when only a few inches and a plastic sack separated the hoverer's face and my underwear. then the lavanderia woman inexplicably dumped my dirty laundry all over the counter top and started picking through it, all while the hoverer was leaning, LEANING, directly over my loot. wow, is it getting hot in here? unbelievable. i don't care how clean you think you are... to have two total strangers sifting through and/or eyeing your skivvies all while you helplessly observe is a new and interesting level of mortification. finally some guy from the back room came out to help the hoverer, leaving just one person to publicly examine my person effects. no wonder my dreams are slightly unhinged. new story: i don't know how he did it, but the other night fox somehow found the american airlines paper bag tag from underneath the bottom of his pack 'n' play and managed to eat it. as he was going to sleep, i heard him gagging slightly and looked in on him, but everything seemed normal and i wasn't too alarmed because he'd been teething and choking on his own fingers, saliva, etc. next morning i found the slobbery remnants of the bag tag in his bed, and the next day i saw the trusty american airlines logo perfectly in tact in his soiled diaper. comforting to know if he were lost someone would have been able to return him to his rightful owners. laundry. oh my. think i'd be a leeetle uncomfortable myself. don't feel too badly about fox eating a tag. one time i found an entire button in JJ's diaper. i swear kids stomach's are indestructable. Holy cow you crack me up! And I'm with you on the dreams thing...I have crazy dreams. Only difference is Kevin can't ever remember his dreams. Keep blogging, I'm loving it! last night b-dog rolled over and his hand accidently punched me in the eye. apparantly i used an explicit and told him to quit horsin' around. that's the kind of talk you learn in a one horse town. Love the sign. Are those prices per piece? That is an amazingly awesome post. I love it all! I can't tell you how hard I am laughing right now. We can't wait to see you up here. Make sure to give me a call or email me! I want to know how it is that there are a thousand different things around for kids but they will always find the one thing that could potentially kill them. heh heh, that totally sounds like the matt i grew up with. way to go on the tag fox! erin i hope you took a pic of that tag post-derrière and that you send it to aa in protest of their bag fees. my niece pooped out a sea shell once. Thanks for making us laugh so hard we are both crying! Can't wait to see you all! o.m.g. i think that was my favorite post...EVER.